A Vegan and Paleo friendly spiralized salad tossed in a light olive oil mustard dressing. SEE NOTES for options if you don’t have a spiralizer. First clean your vegetables. Cut off the tops to both carrot and the celeriac. Place in spiralizer and spiral all your vegetables. If you don’t have a spiralizer, you can just use a grater or julienne cut. Place noodles in bowl and add in all your ingredients minus the parsley and seeds. Toss the noodles with the marinade and let it sit in the fridge for 20-30 minutes. Once it’s marinated in fridge, remove and add your parsley and pumpkin seeds. Serve immediately or keep in fridge for later. 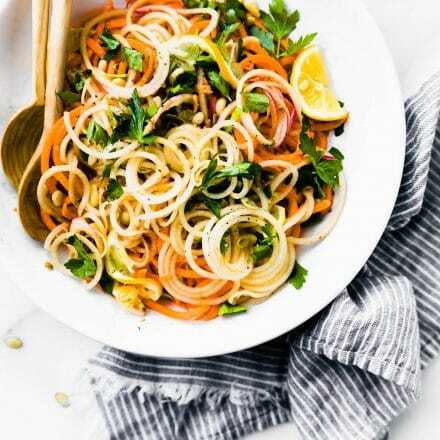 Don’t have spiralizer? Simply julienne cut the vegetables. Don’t have celeriac available? No problem! Try turnips, Jicama, or Daikon radish.